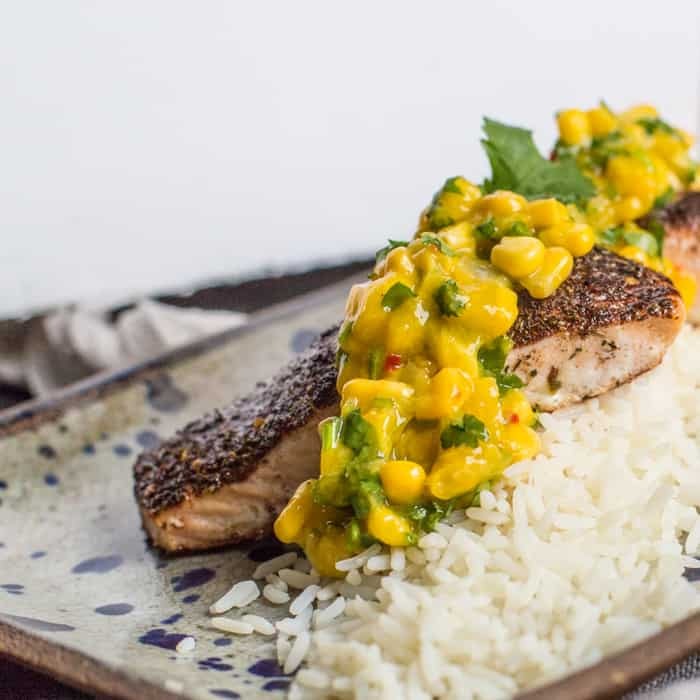 This Jerk Salmon with Mango Salsa is the perfect balance of rustic heat from the jerk rub, and cool sweetness from the mango salsa. It’s well worth doubling up and making extra for tomorrows packed lunch. In my latest kitchen installment, this Jerk Salmon with Mango Salsa came to be after Iceland challenged me to make a meal using 100% frozen foods. I was allowed to use herbs and spices, but the main ingredients needed to use the #PowerOFrozen. Happily I already had some Iceland salmon fillets in the freezer and I’ve been meaning to make a jerk rub for ever. I also had a bag of their rice steam bags which are hard to beat when you’re in a hurry. Lastly, I popped into my local branch when in town to stock up on their bags of mango chunks. So sweet and there’s no waste as you only take out the amount you need. These flavours came together really well. It’s a lovely meal that you can have on the table within 30 minutes. Perfect for a midweek dinner when you’d rather order takeout. I feel like frozen food has always had a bad rap on the quality front. Now I’ve come to learn more about it, that’s a pretty outdated viewpoint. The produce that gets chosen for freezing is usually picked at the height of its growing season. As it’s so abundant at peak season, it is also naturally great value and has the optimum nutritional content. This is great news for us, the consumer, as not only is the fruit and veg perfectly nourishing, it also helps our family budget stretch a little bit further too. Another feather in the cap of frozen food is that hot topic: food waste. I’m sure we’re all guilty of throwing a certain % of our food away when it starts looking tired or furry. We’re doing more than wasting our family’s budget when we toss out a soggy cucumber and yellowing broccoli. Our actions have a much more worrying environmental impact too. The energy that goes into growing and transporting foods, especially if that food is imported from overseas, is astronomical. By buying foods frozen, the ‘shelf’ life is extended by months, and you can defrost just as much food as your family needs for that one meal. Frozen food = less food wastage. It is worth noting that freezing does change the texture of some foods, but I am beginning to learn that those changes can be beneficial too. Remember my Unconventional Christmas Dinner I served up in December? Well those BBQ Brussels sprouts were amazing, and I’m pretty sure they would have been a total disaster if I’d used fresh sprouts! And the defrosted mango used in this salsa is softer than a freshly chopped mango, but see how syrupy the salsa looks? There is no dressing on it. It’s all down to the sweet juice from that mango. It is soooo good! If you make this Jerk Salmon with Mango Salsa please feel free to tag me on Facebook, Twitter or Instagram. I love seeing your food photos! 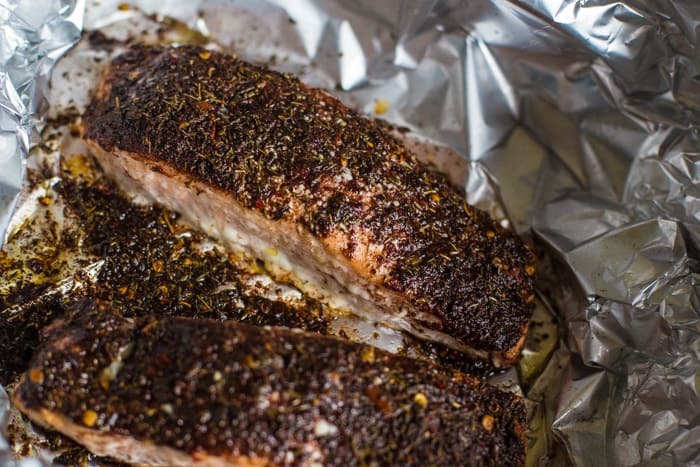 Lay out a sheet of aluminum foil and pop your salmon fillets in the middle. Spray or brush the salmon with a little oil to allow the rub to stick to the frozen fish. Mix all the spices in a cup and cover the top of each piece of salmon generously. This rub mix should b enough to coat 4-6 fillets. Fold the foil up around the fish, crimping the edges together. You want to create a tent to trap in the steam as it cooks. Pop in the oven and cook for 30 minutes. You can open the foil up for the last 10 minutes of cooking time if you like. Meanwhile pop the frozen mango, sweetcorn, onion, coriander & chilli into a freezer bag. Secure the bag and pop it into a bowl of warm water to defrost. If you're a little more organised than me you can defrost this earlier in the day. When it is mostly defrosted, remove from the bag and chop the mango into smaller pieces (about the size of the sweetcorn). Huge thanks to Iceland for sponsoring this content and helping me continue to bring you tasty recipes, for free. As always all views (and leftovers!) are my own. 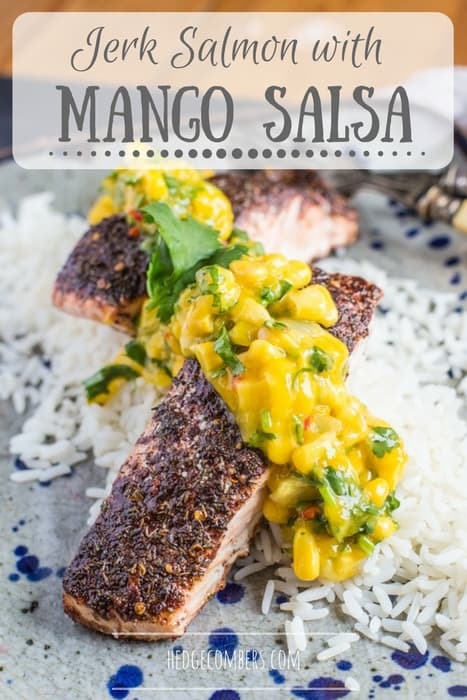 I am always looking for new salmon recipes and a mango salsa would be perfect to balance the jerk seasoning. This recipe in going in my recipe book. Can’t wait to try it. Looks delish. 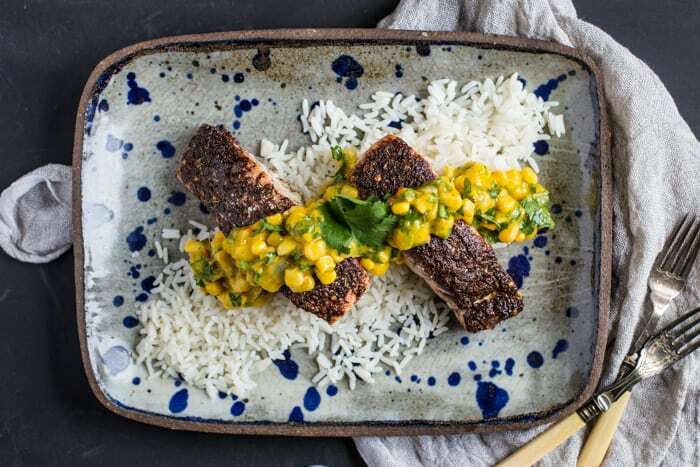 Love jerk spices and I can just imagine how delicious this salmon is paired with the sweet mango salsa – yum! Such a fabulous idea! I LOVE salmon, but I’ve never had it with Jerk flavors before … and I love Jerk flavors! I bet this is amazing, especially with that beautiful mango salsa! Thanks so much for your sweet comment Emily :) You really need do need to try it, I have a feeling you’re gonna love it! That’s a really nice idea for a dish. I love the contrast between the jerk spice and the sweetness of the mango salsa. I love the combination of favors! Thanks for the recipe, Jane! Can’t wait to surprise my family with a new recipe! Thanks Agness, hope you all love it!